With New Line Cinema's IT remake shattering trailer view records, with 197 million views in the first 24 hours, this Stephen King story is certainly more popular than ever. For those who want to explore this story and the original 1990 mini-series, starring Tim Curry in an iconic performance as Pennywise the Clown, you can help make a new documentary about IT happen. 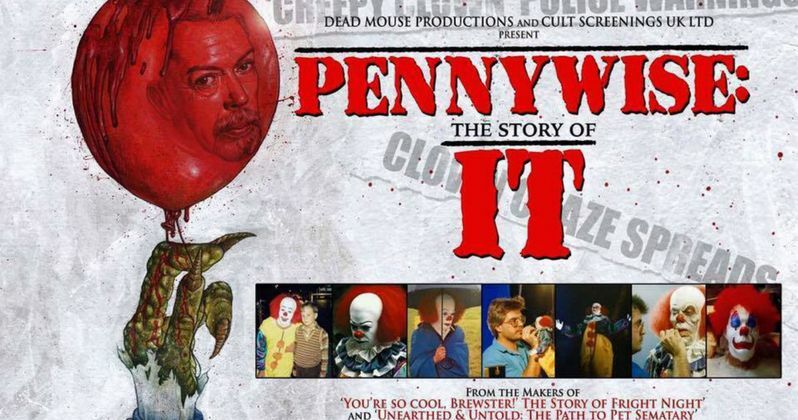 Earlier today, a new IndieGogo campaign was launched for Pennywise: The Story of IT. Here's an official description of the project from Dead Mouse Productions, which is running the crowdfunding campaign. "From Dead Mouse Productions Ltd and Cult Screenings UK Ltd, makers of Leviathan: The Story of Hellraiser and Hellbound: Hellraiser II, You're so cool, Brewster! The Story of Fright Night and RoboDoc: The Creation of RoboCop and John Campopiano, director/writer of Unearthed and Untold: The Path to Pet Sematary comes this brand-new documentary Pennywise: The Story of IT. A fully independent retrospective into the making of Stephen King's IT and its cultural impact over the last 28 years. Supported by dozens of the original cast and crew including Tim Curry, Tommy Lee Wallace and Bart Mixon, Pennywise is made by fans of the IT for fans of IT. The crew have already received support from over 20 of the cast and crew, including acquiring over 2 hours of never-before-seen set footage from SFX wizard Bart Mixon, as well as loads of archival and behind-the-scenes photos and there is no doubt that by the time of production many more key players will be attached to share their amazing stories about one of the most iconic movies ever-made." The IndieGogo campaign kicked off today and it has already raised a quarter of its 20,000 GBP ($25,920) goal in just a few hours. Writer/producer John Campopiano also released another statement, after the IndieGogo campaign was launched. Here's what he had to say below. "As many know, I've teamed up with UK filmmakers Gary Smart and Chris Griffiths, both of whom are based in London, on a brand new documentary about Stephen King's IT called, Pennywise: The Story of IT. Earlier this afternoon we officially launched our Indiegogo campaign which will-hopefully!-be successful and will allow us to tell a story we care deeply about as horror fans and admirers of Tim Curry. Our team would be sincerely grateful if you could help spread the word however possible. Everything about this new endeavor is ambitious, so we're hoping that friends and family-including our extended family in the horror and film communities-can help us make this dream project a reality. From digging into the historical and cultural phenomenon of coulrophobia (the fear of clowns) to Tim Curry's magical portrayal of Pennywise the Clown, to the impact Vancouver (aka "Hollywood North") had on this special made-for-tv miniseries, our project aims to tell a story heard by few and showcase a wealth of behind-the-scenes footage and photos seen by even fewer. As you'll learn from the Indiegogo campaign video and webpage, we've confirmed Tim's involvement in this project as well as 20 other cast and crew-and the list continues to grow. This is going to be a special film for horror fans the world over. We've already been been receiving lots of positive press thus far, which you can read about here, here, and here. Thank YOU for any help you can extend in spreading the word and bringing eyes to this important Indiegogo campaign." The IndieGogo campaign launch also comes with a new trailer that features the filmmakers behind this project, which includes some of the behind-the-scenes footage they have procured for this project. The trailer doesn't mention if Stephen King himself will be involved in Pennywise: The Story of IT or not, but if this project gets enough buzz swirling around it, perhaps that could change. Take a look at the trailer for Pennywise: The Story of IT below.